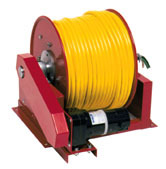 Duro 2800 High Capacity Electric Cord Reels : Industrial Hose Reels : ARK Petroleum Equipment, Inc. 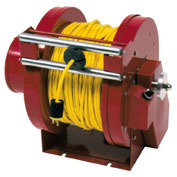 These Duro High Capacity Electric Cord Reels will hold up to 300 ft. of cord and can handle up to 30 AMPs/600 watts. They also have chain and gear drive and heavy duty all steel construction. They are available with 3 or 4 conductors and twist lock plugs. Check out the Hose Capacity Chart, and the Dimension Chart to pick the Duro Hand Rewind Reel that best suits your needs. Don't forget to check out the options for these reels located at the bottom of this page!